If you live in a metropolitan area like San Francisco, New York or Chicago, you understand the appeal of a tiny car. It's easier to swoop through traffic and it can be parked nearly anywhere. 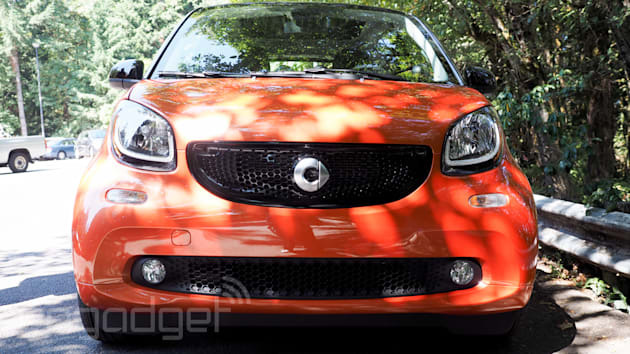 Smart says the Fortwo is the tiniest of the tiny cars available in the United States. The latest version of the Mercedes-Benz-built vehicle is still only 8.8 feet long, but it's gotten wider with more forgiving suspension. It's also filled with additional standard features making it feel more like a car and less like a compromise. To highlight the new diminutive driver's features, Smart set up a scavenger hunt in the retirement community for 30-year-olds: Portland, Oregon. If you're going to take a car meant to tackle an urban environment for a spin, it might as well be in a city with a road system that seems like it was laid out more as a practical joke than a way to get drivers from point A to point B. Don't get me wrong: Portland is a wonderful city. But, like San Francisco, driving can be a challenge when it's not your home. After two days of testing out the vehicle (both a manual and automatic transmission version) the Fortwo lived up to that challenge... mostly. Like all scavenger hunts, the goal was to complete as many tasks as possible in an allotted time. This meant driving to locations both around and in Portland and it was an opportunity to see how the car performed in various environments. My co-pilot and I opted to hit up the locations outside the city first and cruise through the surrounding mountain roads. 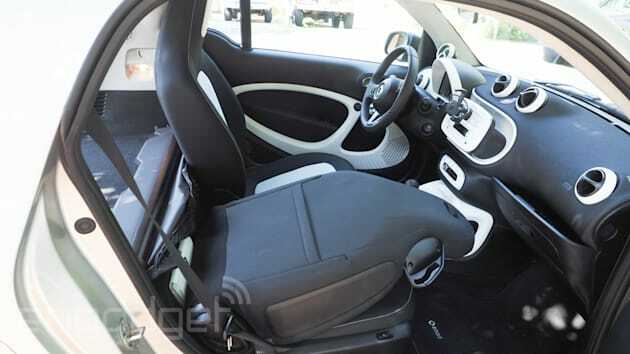 The Fortwo's three-cylinder engine with a manual transmission won't inspire any hill-climbing exhilaration at 89HP with 100 foot-pounds of torque. But, because of the rigidity of the Tridion safety cell, which acts as a roll cage for the car, the car's frame has minimal sway during turns making the handling better than expected. The wider stance helps too. That added width coupled with the 2016 redesign gives the car a more aggressive, almost angry look. Whether this meaner-looking car will deter San Francisco hooligans from flipping the vehicle over is yet to be seen. But if you're driving the new car and you see those vehicle vandals, it's going to be much easier to flip a U-turn and get away from them thanks to the car's awesomely small turning radius. The 22.8-foot turning radius is the smallest in the United States according to Smart. It's also the best feature for anyone that has to drive on narrow city streets and occasionally has to turn around. On multiple occasions, thanks to the vehicle's Cross Connect companion app (which is in beta), I missed a turn or ended up on a dead-end street. Being able to quickly flip around without worrying about the awkward three-point turn I'd have to make in another, larger car was outstanding. It was doubly helpful because not all of my U-turns were actually legal. Something the state of Oregon doesn't need to know about and we can just keep amongst ourselves. But seriously, look at this turning radius. If you combine that small turning radius with the Fortwo's rear engine and rear-wheel drive, you should get some pretty great oversteer, which means sweet donuts in your local parking lot. Unfortunately, the car's traction-control system does everything in its power to keep you on the road. The car wants you to be safe and not end up drifting around corners because you've lost traction. No matter how hard you stomp on the gas in a sharp turn, the car will correct by reducing power to the wheels. If you're thinking you can turn the system off, think again: You cannot. It's like asking the car if it wants to go to a party and it responds by telling you it would rather stay home and do some math homework. Yeah, it makes sense. This isn't a car for the tuning kids; it's for getting downtown and parking in the spot a sedan has passed three times. But it would be nice to cut loose just to see what it can do. Speaking of parking, to help you find tiny spots, you can use the Cross Connect companion app. While demoing it, I was told that it was in beta so I forgave it when (as mentioned above) the navigation system sent me past my destination, decided I needed to drive around the same block until the end of time and, at one point, sent me the wrong way down a one-way street. Did I mention it's in beta? 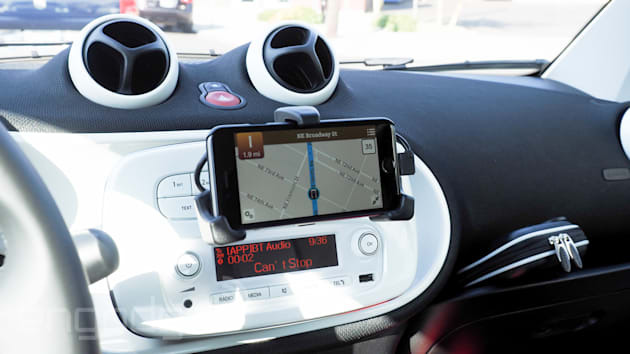 The app also controls the car's radio, displays information about the vehicle (like gas mileage), has a dialer and features a crowdsourced parking space finder for spots that will only fit a Fortwo. And probably because the iOS/Android app is so much a part of the driving experience, Smart has an optional $100 smartphone holder that attaches directly to the dash and charges your phone. Yes, $100 seems pretty steep for something to poke out of your dash. You could buy a cheap holster from Amazon or a mall kiosk for half that price. 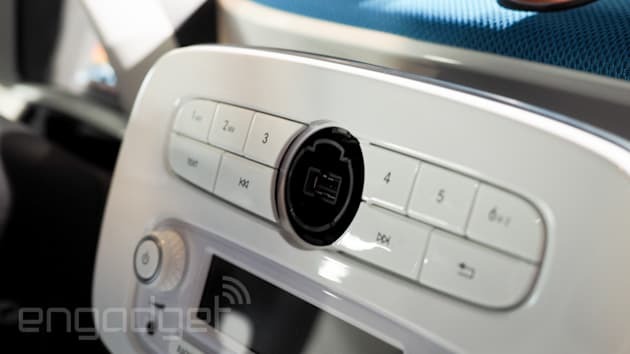 But what the Smart mount has over those third-party solutions is that it connects directly to the entertainment system via a dash port that can be covered when not in use. It reduces clutter and gives it a cleaner appearance. Plus, you don't have to use the Smart app with the cradle. It works with Waze, Google Maps and whatever audio app you want. It's a simple USB connection so even if the navigation feature doesn't get much better, the $100 smartphone holder isn't a complete waste of money. It's another extra piece of equipment that Smart added to the 2016 Fortwo to make it more civilized and to appeal to urban commuters. And while the cradle is an option, Smart has added standard features that should have been there in the first place. Some of these include Bluetooth hands-free calling, cruise control, power steering and power windows. It also added something for anyone that's been blown around by a passing semi: crosswind assist. All of this adds up to a car that actually feels like a modern vehicle instead of the barebones shell that's currently available and doesn't feel all that smart. Smart also now offers a manual or six-speed automatic transmission. The manual is a new addition and will be applauded by driving purists. The updated automatic transmission has a dual clutch for much quicker gearshifts than its predecessor. Both clock in a zero-to-60 speed of a bit over 10 seconds. If you're looking for a "funner" experience, go with the manual to wring out a little bit more power from the tiny car. The vehicle starts at $14,650, hits showrooms in September (an electric version is expected in 2016) and competes economically with the Fiat 500 Pop, Ford Fiesta, Nissan Versa Note and Honda Fit. Of all of those vehicles, the Fiat (at a pricier $16,845) is the tiny-car kindred spirit of the Fortwo. While small, it's still longer than the mini-Benz and has a back seat, which means it's going to be tougher to park. But, you get to bring your short friends with you when you go places. It also has a bigger trunk. As expected, the Fortwo's trunk will fit maybe four grocery bags. For bigger items, the passenger seat folds flat and offers about five feet of space. Perfect for tiny surfboards or some small IKEA furniture. After finishing the scavenger hunt (we tied for first, but the other team finished before us) and spinning around the city totally not breaking any traffic laws, we returned the Fortwo. The next day was less "find stuff as quickly as possible" and more of a drive around the city and highway to get a feel for the car as a regular commuter. The car works well for both, but it's a bit of a bummer that some of its potential fun has been removed because of stability and traction limits placed on the car that can't be turned off. But when your daily commute involves narrow roads, U-turns and a never-ending search for parking, the new Fortwo is a solid commuter that actually feels like a modern car. Even if you can only bring along one friend, at least you can still hit the carpool lane.